Citigroup SIV Fund and Florida Bank Run: Will this wake Up SEC, Fed Chairman Bernanke, Treasury Secretary Paulson and Congress? Parish & Company recommends solution. 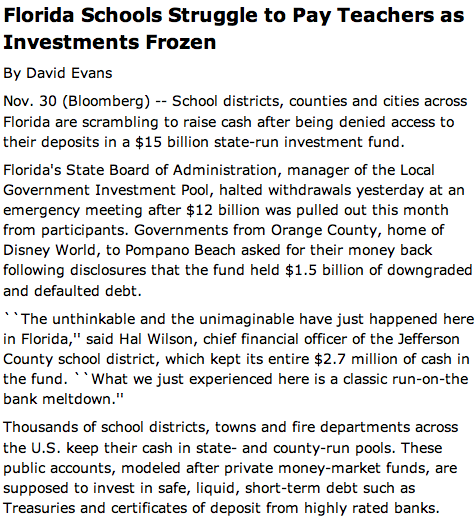 Today Bloomberg followed up on what could be the first in a wave of public and private “bank runs” here in the U.S. Remarkably, investors today still don’t appreciate the difference between high quality money market accounts and those with derivatives. Even more remarkable are the number of such derivative invested funds in 401k and other retirement plans. Let’s be honest, these investments are not about higher returns but rather simply higher fees.Parish & Company recommends investing only in derivative free monehy market funds composed of exclusively government backed securities. Meanwhile, the SEC and Treasury Secretary Paulson, pictured above, continue to pander to hedge funds and private equity firms, even though these firms are completely unregulated, responsible for the current mess and have crept into public and private pensions in a big way. Parish & Company strongly recommends that Congress immediately pass legislation requiring all hedge and private equity funds that have public and private pension assets, in addition to assets from tax other tax free organizations, to declare their complete ownership structure to the SEC, a summary of their top 50 investments and how they are valued and all significant debt agreements with FDIC insured financial institutions within 30 days. Given the tax exempt status of these organizations funding the hedge and private equity firms, clearly the Treasury Secretary has the necessary audit tool to make the requirement. The obvious question now emerges, that being, what if investors at Etrade, Citigroup, Morgan Stanley and Merrill Lynch transferred their accounts to other institutions without mortgage based derivative risks? Remarkably, the Treasury Secretary is getting a free pass in terms of time given this hasn’t started already, let’s just hope he isn’t squandering this time on disingenious political fixes and will go instead to the source of the problem, not only for the nations benefit but also those involved.